When was the last time you visited The Voice of the Marytrs Canada's website? Well, if you haven't for awhile, then I want to encourage you, especially if you live in Canada. Glenn Penner, my friend, does wonderful work there in Canada, and he also writes a wonderful blog that you may be interested in visiting. The reason I bring this up today is because Glenn was mentioned by our friends at Mission Network News today in their daily newsletter. The following is from MNN. Pakistan (MNN) -- Current Pakistani protests over the British knighthood of author Salman Rushdie have raised fears over the future of Christians in the country. A mob attack on evangelicals last week appears to be symptomatic of religious hatred which seemingly has heightened. Glenn Penner of Voice of the Martyrs-Canada says, "It is a matter of harassment. Pakistani Christians face this on a daily basis--not being able to get decent work or facing discrimination in the workplace, if they can find jobs at all. Persecution isn't just incidents; it's an environment. And Pakistani Christians feel very much under pressure." Several Christians have fled the area in fear of further attacks. Penner urges prayer that Christians in Pakistan will not give in to fear. "It's a symptom of Christians who were attacked because they were involved in evangelistic work. They had been threatened. They had been told to cancel this evangelistic meeting. When they refused to do so, they were attacked.This is, unfortunately, not uncommon in Pakistan." Special thanks to our buddies at Compass Direct for this late breaking news. KALGO, Nigeria, June 29 (Compass Direct News) – For Kebbi state pastor Nuhu Mamman, to become a Christian was to have a death sentence passed on the life he knew: converting killed his past, and his future appeared moribund as family, friends and fiancée abandoned him. Raised a Muslim, Mamman received Christ as a young man in 1969. Learning to read and write using only the Bible, Rev. Mamman never attended elementary or high school but ended up attending seminary and becoming pastor of a church with over 2,000 members. Converts to Christianity still face humiliation and stigma, he said. “We are always being forced to transfer former Muslims who have become Christians to other parts of this country in order to shield them from persecution,” Rev. Mamman said. Obtaining places for converts from Islam to worship is problematic; the state finds pretexts for preventing construction of churches or demolishing existing ones, and Muslim extremists burn down sanctuaries. Read the full story at Compass Direct. It's Friday and today I want to take the time to remind all of you dear readers about some of the great ministries that The Voice of the Martyrs engages in. To begin with, if you look over to your right, you will see the list of links on the side bar that go directly to other ministry pages of The Voice of the Martyrs. Here's a brief highlight of each ministry. For more detailed information, be sure to follow the links to their separate webpages. Basic Fellowship is the ministry of VOM that focuses on "brothers and sisters in chains." If you care about prisoners, then not only can you participate by writing prisoners, using Prisoner Alerts, but you can become a part of the BASIC ministry. Bibles Unbound is another ministry of VOM that focuses on sending bibles directly to people in countries where it is hard to get a bible. This is one of my favorite ministries of VOM and for only $30 a month you can send 5 bibles yourself. Be sure to check it out and get involved. Kids of Courage is also another very cool ministry of VOM and if you have children or know children, maybe in your Sunday school class, then you will LOVE the ministsry of Kids of Courage because it is designed to teach children about persecuted Christians in a simple and fun way. I think most adults would really enjoy the Kids of Courage program also. There is a wonderful magazine that focuses on this ministry and when you sign up for the regular VOM magazine you will also get Kids of Courage. Be brave, check out their site. Pastor Support is another special ministry of VOM. As you may guess from the name, it's a special ministry that ministers especially to Pastors. Pastors in persecuted nations have some special needs, and so if you have a heart to minister to the leaders, you may want to get involved with Pastor Support. Then VOM has four other areas that you can get involved in. There is the VOM bookstore, where you can purchase wonderful materials that will inspire you and help you learn more about the persecuted church, and when you do, you also support the ministry of The Voice of the Martyrs. Then there is VOM Groups, Volunteers and Meetings. This is cool because if you want to volunteer - YOU CAN! If you want to find out where there is a meeting featuring a missionary who works with VOM - YOU CAN and if you want to fellowship with other lovers of the persecuted church, yes you guessed it - YOU CAN. And I want to encourage you to do so, because the ministry that God has birthed to minister to suffering saints is so important. UPDATE: If you are interested in hearing this interview, you can either become a Parshall Patriot and listen to it in full, or you can visit WAVA Janet Parshall archives, scroll down to June 28th, hour 3 and forward to the last half hour of the show and hear Todd. Here's a link to the WAVA site. Unfortunately, Janet didn't highlight Todd this time, so you'll have to listen this other way, if you're interested. Todd is sharing how the teens who went to Vietnam to see persecution firsthand. Todd shares with the audience about how the persecuted Christians asked the teens if they ever have problems with the police. The reason...because when you see the DVD you will see how the police harass the Christians in Vietnam. Before the commercial break, Janet mentions that there are over 100 prisoners in Vietnam who have been persecuted because of their faith in Jesus. Janet then highlights some clips from Wolf Blitzer's recent interview with the President of Vietnam, who allows Christian persecution in his country. Todd then shares with Janet about his recent trip to Turkey where there were three men who were murdered. We covered that here on the blog, in case you don't remember. Todd met with the widows of these men and he says that the widows on national TV forgave the men who killed their husbands. Todd said that these women were full of grace and had a great attitude regarding the plan of God for their lives. Todd says he was inspired and "blown away" by their grace and how they are walking like Jesus. Now they are talking about Iran and how people are coming to faith in Christ. Todd says the people who are coming to Christ in Iran have seen the hopelessness of Islam. As a result, the Iranian government is cracking down on the Christians in Iran. Todd asks for prayer for the believers in Iran and Janet closes the show talking about the magazine. Be sure to tune in tomorrow to Janet Parshall's America to hear Todd Nettleton talk about the latest news concerning Christians who are being persecuted for their faith in Christ. Over the last few days I've still been thinking about the two hour movie Underground Reality Vietnam. As I was thinking about it today, something that really struck me was how it is always so easy for us to focus on the physical persecution of a believer, and yet the emotional persecution I think can be far worse. Persecution of the heart is what I call emotional persecution. For the follower of Christ we understand better than those who do not know Christ, the depth of love and passion Jesus Christ has for us. He loved us so much, and He died for us. As Christians, our hearts are changed from stone to flesh because God has circumcised our hearts. So when Christians are persecuted for their faith and trust in Christ, it is deeply felt...and it is painful. This is really evident when you watch Underground Reality Vietnam. There are interviews in the film that made me cry, and the reason why is because you can see the hurt and the emotional pain that these victims of persecution went through. But what is so inspiring is that despite the brokenness of heart, there is a deeper faith than I can imagine because I haven't experience their depth of persecution. You have to see this film to know what I'm talking about. If you're interested, be sure to visit www.undergroundreality.com and when you're praying for the persecuted church, don't just pray for their physical healing, but also for the healing of their hearts. My familiarity with Africa made a devotion in the book, Extreme Devotion, written by The Voice of the Martyrs, even more meaningful. I was touched by the widow’s boldness. In my understanding of African culture and protocol, normally a widow does not address mourners at her husband’s funeral. Usually, if she wants to say something, a family member speaks on her behalf. This courageous widow went against tradition and protocol because what she had to say was extremely important. In my opinion, the words and tone she used spoke of extreme devotion and grace. Her firm grasp and understanding of who God was before the attack, and who He was in the midst of her pain, is an example of what it means to be like Christ. As you read part of the devotion below, pray for families of martyrs around the world. Ask God to give them boldness to share the gospel. She stood over her husband’s coffin. There were tears in her eyes, but her voice was strong. The bruises on her body told the mourners that she too, had been beaten. As Christians, she and her husband had refused to take a Kikuyu tribal oath that wasn’t consistent with their Christian faith. For this her husband was beaten to death, and she was beaten and hospitalized. “…I, as a widow, also tell all of you, in the presence of my dead husband, that I hate none of those who killed him. I love the killers. I forgive them, knowing that Christ has died for them too.” No one in attendance that day would ever forget the widow’s words or her example of extreme forgiveness and grace. In a nation with historically Christian roots, we often forget how revolutionary the teachings of Christ are. The biblical picture of marriage is radical. It is based on a self-sacrificial love and total dependence on God as the authority over both male and female. However, despite our Christian roots, 50 percent of all marriages in this country end in divorce. As Christians, we have a higher standard to aim for in keeping our marriages intact, but have you ever thought of marriage as evangelism? Praise God that our God is one that transforms every part of our lives, even our marriages. Praise the Lord when we turn our lives over to Him, His presence in our lives shows to others. This post couldn't wait until tomorrow because when I see a great film I just have to tell everyone. Seriously, just ask any of my church family and they will tell you that I can't be quiet about great media that exalts and shows Christ and His people the way they really are. Well, today I took the time to watch this new DVD produced by The Voice of the Martyrs and The Jordan Group and all I can say is that every Christian in America needs to see this film. In fact, a comparison to this film would be the popular TBN show Travel the Road. Not only was the production of the film wonderful, including popular cutting edge music from some of today's Christian music bands, but the message of the film was awesome. 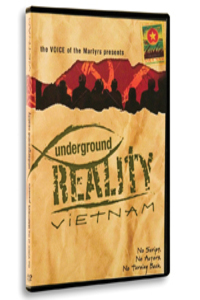 Underground Reality Vietnam takes you on a journey with some teenagers into the underground church in communist Vietnam. You will see the teens perspective before they get to Vietnam and then as you walk with them through the four different shows, which comes up to a total of two hours of viewing, you will see how the Lord impacted them and changed their understanding and perception of the persecuted church. I was honestly overwhelmed to tears all throughout this film because these kids got it....they saw how good God has been to them, and how difficult it is for persecuted Christians in Vietnam where religious freedom isn't free. However, what is even more impacting is that when you hear the Vietnam Christians share their stories, and then you actually get to go inside numerous venues that they work and worship in, all I can say is that it is AWESOME. In fact, there is one scene that really showed the difference in worship where you will see the underground church worshipping with all of their hearts - singing and clapping and literally singing at the top of their lungs. Then you'll see the teens doing a contemporary worship song with guitar and the contrast coudn't be more stark. Another thing that I really enjoyed was seeing some of The Voice of the Martyrs shipping facilities. I've never been to VOM headquarters and so it was really cool to actually see the warehouse where all the bibles and other materials are stocked. The film also showed the teens getting to literally smuggle bibles into Vietnam, bringing them to the underground church and even doing a clandestine drop of bibles at a local venue. You'll have to see the film to learn where the venue is because I never would have suspected bibles being smuggled there! In another words, I want you to get this DVD. In fact, I plan on taking it and showing it to my pastor, the youth group and practically anyone else who will listen. The only thing I need to find out now is if VOM is going to do another one. I hope so. Please visit www.undergroundreality.com to view a short movie trailer and you'll understand why you need to get a copy of this. You can also read blog entries and learn a lot more about the trip at this same website. CLICK HERE TO ORDER AND THEN SHARE IT WITH A FRIEND. Gaza (MNN) -- As Hamas and Fatah factions battled for control of Gaza, a Christian school and church near a major security headquarters were targeted by militants. According to Glenn Penner of Voice of the Martyrs-Canada: "Some books were burned, computers were stolen, and some furniture was destroyed; so believers are concerned also about acts of vandalism. They have received threats from some more radical elements that if they don't stop their Christian activities, they could see even more violence." Believers are awaiting signs of what the future may hold. Penner says there's much to pray about in the days ahead. "Things have settled down to a degree. Unfortunately, the group that has taken control, Hamas, is a far more militant organization, and time is only going to tell just how much they're going to implement Sharia law in Gaza. Things are certainly going to be better for believers in the West Bank, which is under the control of Fatah."